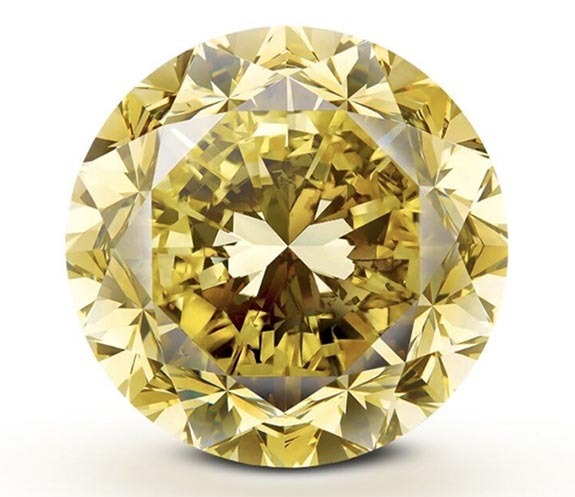 Tipping the scales at 54.21 carats, the recently unveiled "Mouawad Dragon" is being billed as the largest round brilliant-cut fancy vivid yellow diamond ever graded by the Gemological Institute of America. The luxury diamond house chose the name "Mouawad Dragon" because the vibrant color beaming from every facet of the diamond showcases the power, wisdom and good fortune of the mystical serpent, the company stated in a press release. The yellow color, Mouawad added, is also reminiscent of a dragon's magical powers and fiery eye. The rough stone was discovered in an alluvial deposit in South Africa, and it took Mouawad's master cutters more than six months to transform it into the "Mouawad Dragon" — a precious gem that certainly rates as one of the most revered yellow diamonds of all time. Then company's next task is to design a necklace that will showcase the 54.21-carat stone. "We're thrilled to have had the opportunity to craft this extraordinary diamond from the rough," said Fred Mouawad, Co-Guardian of Mouawad's Diamond Division, "and we will soon continue the creative process by designing a masterpiece that befits its dazzling beauty." The necklace will be part of an ensemble that Mouawad will unveil next month, according to Rapaport News. The "Mouawad Dragon" joins the ever-growing Mouawad collection, which includes the 51.12-carat D-flawless Dynasty diamond, the 245.35-carat Jubilee Diamond, the 135.92-carat Queen of Holland diamond, the famous 69.42-carat Taylor-Burton Diamond and a yet-to-be named 218.08-carat D-color marvel, which is said to be the largest internally flawless cushion-shaped diamond in the world. Credit: Image courtesy of PRNewsfoto/Mouawad.